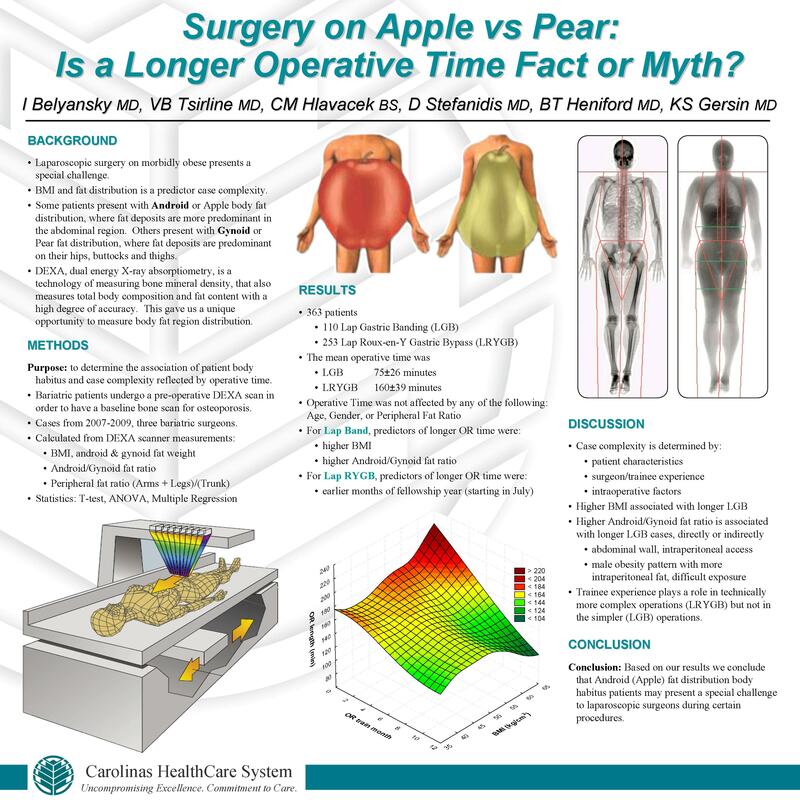 Surgery On Apple vs. Pear, Is a Longer Operative Time Fact Or Myth? Laparoscopic surgery on morbidly obese patients is thought to present a special challenge. Experts in the field note that besides BMI, the distribution of body fat is a predictor of a challenging laparoscopic case. Some patients present with android or Apple body fat distribution, where fat deposits are more predominant in the abdominal region. Others present with Gynoid or Pear fat distribution, where fat deposits are predominant on their hips, buttocks and thighs. As part of osteoporosis monitoring protocol, bariatric patients at our institution undergo a pre-operative DEXA scan in order to have a baseline bone scan. DEXA, dual energy X-ray absorptiometry, is technology of measuring bone mineral density, that also measures total body composition and fat content with high degree of accuracy. This gave us a unique opportunity to measure body fat region distribution. The purpose of this study was to characterize the relationship of patient body habitus and operative time. The experience of three bariatric surgeons from 2007-2009 was reviewed. Only patients with pre-operative DEXA scan undergoing a bariatric procedure were included. The following variables were obtained or calculated from DEXA scanner measurements: BMI, android fat weight, Gynoid fat weight, Android/Gynoid fat weight (AG) ratio, and Peripheral fat ratio (Arms + Legs fat weight)/(Trunk fat weight). Linear regression methods were used to analyze the relationship between operative time (OT) and aforementioned variables from the DEXA scanner. 307 patients with pre-operative DEXA scans were included: 99 patients underwent a Laparoscopic Gastric Banding (LGB) procedure and 208 patients underwent a Laparoscopic Roux-En-Y Gastric Bypass (LRYGB) procedure. The mean time for a LGB and LRYGB was 75±27 and 157±35 minutes respectively. OT increase in LGB patients correlates with increase in pre-operative BMI, Android fat weigh and AG ratio, p<0.02; OT was not effected by increase in Gynoid fat weight. LGB patients were also observed to have a downward trend in OT as peripheral fat ratio increased, although this relationship was not statistically significant. In LRYGB patients, the increase in pre-operative BMI, Android fat mass, Gynoid fat mass and peripheral fat ratio had no correlation with increase in OT. Upward trend in OT was observed with increase in AG ratio, although no statistical significance was seen. Our review of 307 patients shows that Android to Gynoid ratio may have value in predicting the length of operative time. This is seen in Laparoscopic Gastric Band patients where increase in operative time is related to increase in AG ratio, a relationship that is statistically significant. Similar trends are seen when looking at the AG ratio in the Laparoscopic Roux-En-Y Gastric Bypass patients, although that relationship lacks statistical significance. Based on our results we conclude that Apple-fat distribution body habitus patients may present a special challenge to laparoscopic surgeons during certain procedures.